This article is about the scientist. 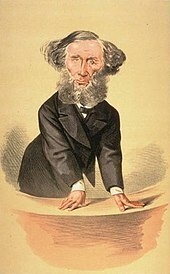 For the politician, see John Tyndall (politician). For the Canadian poet, see John Tyndall (poet). John Tyndall FRS (/ˈtɪndəl/; 2 August 1820 – 4 December 1893) was a prominent 19th-century Irish physicist. His initial scientific fame arose in the 1850s from his study of diamagnetism. Later he made discoveries in the realms of infrared radiation and the physical properties of air. Tyndall also published more than a dozen science books which brought state-of-the-art 19th century experimental physics to a wide audience. From 1853 to 1887 he was professor of physics at the Royal Institution of Great Britain in London. Tyndall was born in Leighlinbridge, County Carlow, Ireland. His father was a local police constable, descended from Gloucestershire emigrants who settled in southeast Ireland around 1670. Tyndall attended the local schools (Ballinabranna Primary School) in County Carlow until his late teens, and was probably an assistant teacher near the end of his time there. Subjects learned at school notably included technical drawing and mathematics with some applications of those subjects to land surveying. He was hired as a draftsman by the Ordnance Survey of Ireland in his late teens in 1839, and moved to work for the Ordnance Survey for Great Britain in 1842. In the decade of the 1840s, a railroad-building boom was in progress, and Tyndall's land surveying experience was valuable and in demand by the railway companies. Between 1844 and 1847, he was lucratively employed in railway construction planning. In 1847 Tyndall opted to become a mathematics and surveying teacher at (Queenwood College), a boarding school in Hampshire. Recalling this decision later, he wrote: "the desire to grow intellectually did not forsake me; and, when railway work slackened, I accepted in 1847 a post as master in Queenwood College." Another recently arrived young teacher at Queenwood was Edward Frankland, who had previously worked as a chemical laboratory assistant for the British Geological Survey. Frankland and Tyndall became good friends. On the strength of Frankland's prior knowledge, they decided to go to Germany to further their education in science. Among other things, Frankland knew that certain German universities were ahead of any in Britain in experimental chemistry and physics. (British universities were still focused on classics and mathematics and not laboratory science.) The pair moved to Germany in summer 1848 and enrolled at the University of Marburg, attracted by the reputation of Robert Bunsen as a teacher. Tyndall studied under Bunsen for two years. Perhaps more influential for Tyndall at Marburg was Professor Hermann Knoblauch, with whom Tyndall maintained communications by letter for many years afterwards. Tyndall's Marburg dissertation was a mathematical analysis of screw surfaces in 1850 (under Friedrich Ludwig Stegmann). Tyndall stayed in Germany for a further year doing research on magnetism with Knoblauch, including some months' visit at the Berlin laboratory of Knoblauch's main teacher, Heinrich Gustav Magnus. It is clear today that Bunsen and Magnus were among the very best experimental science instructors of the era. Thus, when Tyndall returned to live in England in summer 1851, he probably had as good an education in experimental science as anyone in England. Tyndall's early original work in physics was his experiments on magnetism and diamagnetic polarity, on which he worked from 1850 to 1856. His two most influential reports were the first two, co-authored with Knoblauch. One of them was entitled "The magneto-optic properties of crystals, and the relation of magnetism and diamagnetism to molecular arrangement", dated May 1850. The two described an inspired experiment, with an inspired interpretation. These and other magnetic investigations very soon made Tyndall known among the leading scientists of the day. He was elected a Fellow of the Royal Society in 1852. In his search for a suitable research appointment, he was able to ask the longtime editor of the leading German physics journal (Poggendorff) and other prominent men to write testimonials on his behalf. In 1853, he attained the prestigious appointment of Professor of Natural Philosophy (Physics) at the Royal Institution in London, due in no small part to the esteem his work had garnered from Michael Faraday, the leader of magnetic investigations at the Royal Institution. About a decade later Tyndall was appointed the successor to the positions held by Michael Faraday at the Royal Institution on Faraday's retirement. Tyndall explained the heat in the Earth's atmosphere in terms of the capacities of the various gases in the air to absorb radiant heat, also known as infrared radiation. His measuring device, which used thermopile technology, is an early landmark in the history of absorption spectroscopy of gases. He was among the first to correctly measure the relative infrared absorptive powers of the gases nitrogen, oxygen, water vapour, carbon dioxide, ozone, methane, etc. (year 1859), after Eunice Foote in 1856. He concluded that water vapour is the strongest absorber of radiant heat in the atmosphere and is the principal gas controlling air temperature. Absorption by the other gases is not negligible but relatively small. Prior to Tyndall it was widely surmised that the Earth's atmosphere has a Greenhouse Effect, but he was the first to prove it. The proof was that water vapour strongly absorbed infrared radiation. Relatedly, Tyndall in 1860 was first to demonstrate and quantify that visually transparent gases are infrared emitters. He devised demonstrations that advanced the question of how radiant heat is absorbed and emitted at the molecular level. He appears to be the first person to have demonstrated experimentally that emission of heat in chemical reactions has its physical origination within the newly created molecules (1864). He produced instructive demonstrations involving the incandescent conversion of infrared into visible light at the molecular level, which he called calorescence (1865), in which he used materials that are transparent to infrared and opaque to visible light or vice versa. He usually referred to infrared as "radiant heat", and sometimes as "ultra-red undulations", as the word "infrared" did not start coming into use until the 1880s. His main reports of the 1860s were republished as a 450-page collection in 1872 under the title Contributions to Molecular Physics in the Domain of Radiant Heat. In the investigations on radiant heat in air it had been necessary to use air from which all traces of floating dust and other particulates had been removed. A very sensitive way to detect particulates is to bathe the air with intense light. The scattering of light by particulate impurities in air and other gases, and in liquids, is known today as the Tyndall Effect or Tyndall Scattering. In studying this scattering during the late 1860s Tyndall was a beneficiary of recent improvements in electric-powered lights. He also had the use of good light concentrators. He developed the nephelometer and similar instruments that show properties of aerosols and colloids through concentrated light beams against a dark background and are based on exploiting the Tyndall Effect. (When combined with microscopes, the result is the ultramicroscope, which was developed later by others). He was the first to observe and report the phenomenon of thermophoresis in aerosols. He spotted it surrounding hot objects while investigating the Tyndall Effect with focused lightbeams in a dark room. He devised a better way to demonstrate it, and then simply reported it (1870), without investigating the physics of it in depth. In radiant-heat experiments that called for much laboratory expertise in the early 1860s, he showed for a variety of readily vaporisable liquids that, molecule for molecule, the vapour form and the liquid form have essentially the same power to absorb radiant heat. (In modern experiments using narrow-band spectra, some small differences are found that Tyndall's equipment was unable to get at; see e.g. absorption spectrum of H2O). He consolidated and enhanced the results of Desains, Forbes, Knoblauch and others demonstrating that the principal properties of visible light can be reproduced for radiant heat – namely reflection, refraction, diffraction, polarisation, depolarisation, double refraction, and rotation in a magnetic field. When studying the absorption of radiant heat by ozone, he came up with a demonstration that helped confirm or reaffirm that ozone is an oxygen cluster (1862). In the lab he came up with the following simple way to obtain "optically pure" air, i.e. air that has no visible signs of particulate matter. He built a square wooden box with a couple of glass windows on it. Before closing the box, he coated the inside walls and floor of the box with glycerin, which is a sticky syrup. He found that after a few days' wait the air inside the box was entirely particulate-free when examined with strong light beams through the glass windows. The various floating-matter particulates had all ended up getting stuck to the walls or settling on the sticky floor. Now, in the optically pure air there were no signs of any "germs", i.e. no signs of floating micro-organisms. Tyndall sterilised some meat-broths by simply boiling them, and then compared what happened when he let these meat-broths sit in the optically pure air, and in ordinary air. The broths sitting in the optically pure air remained "sweet" (as he said) to smell and taste after many months of sitting, while the ones in ordinary air started to become putrid after a few days. This demonstration extended Louis Pasteur's earlier demonstrations that the presence of micro-organisms is a precondition for biomass decomposition. However, the next year (1876) Tyndall failed to consistently reproduce the result. Some of his supposedly heat-sterilized broths rotted in the optically pure air. From this Tyndall was led to find viable bacterial spores (endospores) in supposedly heat-sterilized broths. He discovered the broths had been contaminated with dry bacterial spores from hay in the lab. All bacteria are killed by simple boiling, except that bacteria have a spore form that can survive boiling, he correctly contended, citing research by Ferdinand Cohn. Tyndall found a way to eradicate the bacterial spores that came to be known as "Tyndallization". Tyndallization historically was the earliest known effective way to destroy bacterial spores. At the time, it affirmed the "germ theory" against a number of critics whose experimental results had been defective from the same cause. During the mid-1870s Pasteur and Tyndall were in frequent communication. Invented a better fireman's respirator, a hood that filtered smoke and noxious gas from air (1871, 1874). In his lectures at the Royal Institution Tyndall put a great value on, and was talented at producing, lively, visible demonstrations of physics concepts. In one lecture, Tyndall demonstrated the propagation of light down through a stream of falling water via total internal reflection of the light. It was referred to as the "light fountain". It is historically significant today because it demonstrates the scientific foundation for modern fibre optic technology. During second half of the 20th century Tyndall was usually credited with being the first to make this demonstration. However, Jean-Daniel Colladon published a report of it in Comptes Rendus in 1842, and there's some suggestive evidence that Tyndall's knowledge of it came ultimately from Colladon and no evidence that Tyndall claimed to have originated it himself. Tyndall was an experimenter and laboratory apparatus builder, not an abstract model builder. But in his experiments on radiation and the heat-absorptive power of gases, he had an underlying agenda to understand the physics of molecules. Tyndall said in 1879: "During nine years of labour on the subject of radiation [in the 1860s], heat and light were handled throughout by me, not as ends, but as instruments by the aid of which the mind might perchance lay hold upon the ultimate particles of matter." This agenda is explicit in the title he picked for his 1872 book Contributions to Molecular Physics in the Domain of Radiant Heat. It is present less explicitly in the spirit of his widely read 1863 book Heat Considered as a Mode of Motion. Besides heat he also saw magnetism and sound propagation as reducible to molecular behaviours. Invisible molecular behaviours were the ultimate basis of all physical activity. With this mindset, and his experiments, he outlined an account whereby differing types of molecules have differing absorptions of infrared radiation because their molecular structures give them differing oscillating resonances. He'd gotten into the oscillating resonances idea because he'd seen that any one type of molecule has differing absorptions at differing radiant frequencies, and he was entirely persuaded that the only difference between one frequency and another is the frequency. He'd also seen that the absorption behaviour of molecules is quite different from that of the atoms composing the molecules. For example, the gas nitric oxide (NO) absorbed more than a thousand times more infrared radiation than either nitrogen (N2) or oxygen (O2). He'd also seen in several kinds of experiments that – no matter whether a gas is a weak absorber of broad-spectrum radiant heat – any gas will strongly absorb the radiant heat coming from a separate body of the same type of gas. That demonstrated a kinship between the molecular mechanisms of absorption and emission. Such a kinship was also in evidence in experiments by Balfour Stewart and others, cited and extended by Tyndall, that showed with respect to broad-spectrum radiant heat that molecules that are weak absorbers are weak emitters and strong absorbers are strong emitters. (For example, rock-salt is an exceptionally poor absorber of heat via radiation, and a good absorber of heat via conduction. When a plate of rock-salt is heated via conduction and let stand on an insulator, it takes an exceptionally long time to cool down; i.e., it's a poor emitter of infrared.) The kinship between absorption and emission was also consistent with some generic or abstract features of resonators. The chemical decomposition of molecules by lightwaves (photochemical effect) convinced Tyndall that the resonator could not be the molecule as a whole unit; it had to be some substructure, because otherwise the photochemical effect would be impossible. But he was without testable ideas as to the form of this substructure, and did not partake in speculation in print. His promotion of the molecular mindset, and his efforts to experimentally expose what molecules are, has been discussed by one historian under the title "John Tyndall, The Rhetorician of Molecularity". Tyndall visited the Alps mountains in 1856 for scientific reasons and ended up becoming a pioneering mountain climber. He visited the Alps almost every summer from 1856 onward, was a member of the very first mountain-climbing team to reach the top of the Weisshorn (1861), and lead of one of the early teams to reach the top of the Matterhorn (1868). He is one the names associated with the "Golden age of alpinism" — the mid-Victorian years when the more difficult of the Alpine peaks were summited for the first time. John Tyndall explored the glacial tributaries feeding Mer de Glace in 1857. General topology (left); dirt-bands in glacier (right). In the Alps, Tyndall studied glaciers, and especially glacier motion. His explanation of glacial flow brought him into dispute with others, particularly James David Forbes. Much of the early scientific work on glacier motion had been done by Forbes, but Forbes at that time didn't know of the phenomenon of regelation which was discovered a little later by Michael Faraday. Regelation played a key role in Tyndall's explanation. Forbes didn't see regelation in the same way at all. Complicating their debate, a disagreement arose publicly over who deserved to get investigator credit for what. Articulate friends of Forbes, as well as Forbes himself, thought that Forbes should get the credit for most of the good science, whereas Tyndall thought the credit should be distributed more widely. Tyndall commented: "The idea of semi-fluid motion belongs entirely to Louis Rendu; the proof of the quicker central flow belongs in part to Rendu, but almost wholly to Louis Agassiz and Forbes; the proof of the retardation of the bed belongs to Forbes alone; while the discovery of the locus of the point of maximum motion belongs, I suppose, to me." When Forbes and Tyndall were in the grave, their disagreement was continued by their respective official biographers. Everyone tried to be reasonable, but agreement wasn't attained. More disappointingly, aspects of glacier motion remained not understood or not proved. Tyndall Glacier located in Chile and Tyndall Glacier in Colorado were named after John Tyndall, as is Mount Tyndall in California and Mount Tyndall in Tasmania. John Tyndall's tutorial books about physics contained many illustrations. This one, from Heat Considered as Mode of Motion, is his setup for demonstrating that air cools during the act of expanding in volume; and that air heats up during the act of compressing in volume. (Click on image for more explanation). Besides being a scientist, John Tyndall was a science teacher and evangelist for the cause of science. He spent a significant amount of his time disseminating science to the general public. He gave hundreds of public lectures to non-specialist audiences at the Royal Institution in London. When he went on a public lecture tour in the USA in 1872, large crowds of non-scientists paid fees to hear him lecture about the nature of light. A typical statement of Tyndall's reputation at the time is this from a London publication in 1878: "Following the precedent set by Faraday, Professor Tyndall has succeeded not only in original investigation and in teaching science soundly and accurately, but in making it attractive.... When he lectures at the Royal Institution the theatre is crowded." Tyndall said of the occupation of teacher "I do not know a higher, nobler, and more blessed calling." His greatest audience was gained ultimately through his books, most of which were not written for experts or specialists. He published more than a dozen science books. From the mid-1860s on, he was one of the world's most famous living physicists, due firstly to his skill and industry as a tutorialist. Most of his books were translated into German and French with his main tutorials staying in print in those languages for decades. As an indicator of his teaching attitude, here are his concluding remarks to the reader at the end of a 200-page tutorial book for a "youthful audience", The Forms of Water (1872): "Here, my friend, our labours close. It has been a true pleasure to me to have you at my side so long. In the sweat of our brows we have often reached the heights where our work lay, but you have been steadfast and industrious throughout, using in all possible cases your own muscles instead of relying upon mine. Here and there I have stretched an arm and helped you to a ledge, but the work of climbing has been almost exclusively your own. It is thus that I should like to teach you all things; showing you the way to profitable exertion, but leaving the exertion to you.... Our task seems plain enough, but you and I know how often we have had to wrangle resolutely with the facts to bring out their meaning. The work, however, is now done, and you are master of a fragment of that sure and certain knowledge which is founded on the faithful study of nature.... Here then we part. And should we not meet again, the memory of these days will still unite us. Give me your hand. Good bye." As another indicator, here is the opening paragraph of his 350-page tutorial entitled Sound (1867): "In the following pages I have tried to render the science of acoustics interesting to all intelligent persons, including those who do not possess any special scientific culture. The subject is treated experimentally throughout, and I have endeavoured so to place each experiment before the reader that he should realise it as an actual operation." In the preface to the 3rd edition of this book, he reports that earlier editions were translated into Chinese at the expense of the Chinese government and translated into German under the supervision of Hermann von Helmholtz (a big name in the science of acoustics). 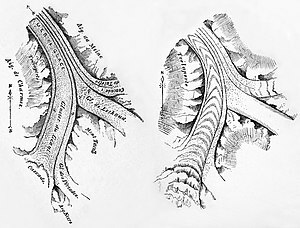 His first published tutorial, which was about glaciers (1860), similarly states: "The work is written with a desire to interest intelligent persons who may not possess any special scientific culture." His most widely praised tutorial, and probably his biggest seller, was the 550-page "Heat: a Mode of Motion" (1863; updated editions until 1880). It was in print for at least 50 years, and is in print today. Its primary feature is, as James Clerk Maxwell said in 1871, "the doctrines of the science [of heat] are forcibly impressed on the mind by well-chosen illustrative experiments." 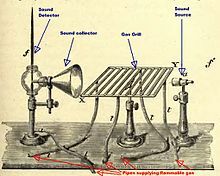 Tyndall's three longest tutorials, namely Heat (1863), Sound (1867), and Light (1873), represented state-of-the-art experimental physics at the time they were written. Much of their contents were recent major innovations in the understanding of their respective subjects, which Tyndall was the first writer to present to a wider audience. One caveat is called for about the meaning of "state of the art". The books were devoted to laboratory science and they avoided mathematics. In particular, they contain absolutely no infinitesimal calculus. Mathematical modelling using infinitesimal calculus, especially differential equations, was a component of the state-of-the-art understanding of heat, light and sound at the time. The majority of the progressive and innovative British physicists of Tyndall's generation were conservative and orthodox on matters of religion. That includes for example James Joule, Balfour Stewart, James Clerk Maxwell, George Gabriel Stokes and William Thomson – all names investigating heat or light contemporaneously with Tyndall. These conservatives believed, and sought to strengthen the basis for believing, that religion and science were consistent and harmonious with each other. Tyndall, however, was a member of a club that vocally supported Darwin's theory of evolution and sought to strengthen the barrier, or separation, between religion and science. The most prominent member of this club was the anatomist Thomas Henry Huxley. Tyndall first met Huxley in 1851 and the two had a lifelong friendship. Chemist Edward Frankland and mathematician Thomas Archer Hirst, both of whom Tyndall had known since before going to university in Germany, were members too. Others included the social philosopher Herbert Spencer. Though not nearly so prominent as Huxley in controversy over philosophical problems, Tyndall played his part in communicating to the educated public what he thought were the virtues of having a clear separation between science (knowledge & rationality) and religion (faith & spirituality). As the elected president of the British Association for the Advancement of Science in 1874, he gave a long keynote speech at the Association's annual meeting held that year in Belfast. The speech gave a favourable account of the history of evolutionary theories, mentioning Darwin's name favourably more than 20 times, and concluded by asserting that religious sentiment should not be permitted to "intrude on the region of knowledge, over which it holds no command". This was a hot topic. The newspapers carried the report of it on their front pages – in the British Isles, North America, even the European Continent – and many critiques of it appeared soon after. The attention and scrutiny increased the friends of the evolutionists' philosophical position, and brought it closer to mainstream ascendancy. In Rome the Pope in 1864 decreed that it was an error that "reason is the ultimate standard by which man can and ought to arrive at knowledge" and an error that "divine revelation is imperfect" in the Bible – and anyone maintaining those errors was to be "anathematized" – and in 1888 decreed as follows: "The fundamental doctrine of rationalism is the supremacy of the human reason, which, refusing due submission to the divine and eternal reason, proclaims its own independence.... A doctrine of such character is most hurtful both to individuals and to the State.... It follows that it is quite unlawful to demand, to defend, or to grant, unconditional [or promiscuous] freedom of thought, speech, writing, or religion." Those principles and Tyndall's principles were profound enemies. Luckily for Tyndall he didn't need to get into a contest with them in Britain, nor in most other parts of the world. Even in Italy, Huxley and Darwin were awarded honorary medals and most of the Italian governing class was hostile to the papacy. But in Ireland during Tyndall's lifetime the majority of the population grew increasingly doctrinaire and vigorous in its Roman Catholicism and also grew stronger politically. It would have been a waste of time for Tyndall to debate the Irish Catholics, but between 1886 and 1893 Tyndall was active in the debate in England about whether to give the Catholics of Ireland more freedom to go their own way. Like the great majority of Irish-born scientists of the 19th century he opposed the Irish Home Rule Movement. He had ardent views about it, which were published in newspapers and pamphlets. For example, in an opinion piece in The Times on 27 December 1890 he saw priests and Catholicism as "the heart and soul of this movement" and wrote that placing the non-Catholic minority under the dominion of "the priestly horde" would be "an unspeakable crime". He tried unsuccessfully to get the UK's premier scientific society to denounce the Irish Home Rule proposal as contrary to the interests of science. In several essays included in his book Fragments of Science for Unscientific People, Tyndall attempted to dissuade people from believing in the potential effectiveness of prayers. At the same time, though, he was not broadly anti-religious. Many of his readers interpret Tyndall to be a confirmed agnostic, though he never explicitly declared himself to be so. The following statement from Tyndall is an example of Tyndall's agnostic mindset, made in 1867, and reiterated in 1878: "The phenomena of matter and force come within our intellectual range... but behind, and above, and around us the real mystery of the universe lies unsolved, and, as far as we are concerned, is incapable of solution.... Let us lower our heads, and acknowledge our ignorance, priest and philosopher, one and all." Tyndall did not marry until age 55. His bride, Louisa Hamilton, was the 30-year-old daughter of a member of parliament (Lord Claud Hamilton, M.P.). The following year, 1877, they built a summer chalet at Belalp in the Swiss Alps. Before getting married Tyndall had been living for many years in an upstairs apartment at the Royal Institution and continued living there after marriage until 1885 when a move was made to a house near Haslemere 45 miles southwest of London. The marriage was a happy one and without children. He retired from the Royal Institution at age 66 having complaints of ill health. Tyndall became financially well-off from sales of his popular books and fees from his lectures (but there is no evidence that he owned commercial patents). For many years he got non-trivial payments for being a part-time scientific advisor to a couple of quasi-governmental agencies and partly donated the payments to charity. His successful lecture tour of the United States in 1872 netted him a substantial amount of dollars, all of which he promptly donated to a trustee for fostering science in America. Late in life his money donations went most visibly to the Irish Unionist political cause. When he died, his wealth was £22,122. For comparison's sake, the income of a police constable in London was about £80 per year at the time. Afterwards, Tyndall's wife took possession of his papers and assigned herself supervisor of an official biography of him. She dragged her feet on the project, however, and it was still unfinished when she died in 1940 aged 95. The book eventually appeared in 1945, written by A. S. Eve and C. H. Creasey, whom Louisa Tyndall had authorised shortly before her death. 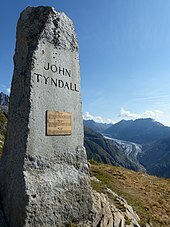 John Tyndall is commemorated by a memorial (the Tyndalldenkmal) erected at an elevation of 2,340 metres (7,680 ft) on the mountain slopes above the village of Belalp, where he had his holiday home, and in sight of the Aletsch Glacier, which he had studied. ^ When working for the government's land surveying agency in Lancashire, Tyndall was one of a number of employees who signed a petition calling for higher wages plus some other changes in working conditions. In November 1843 all of the signatories to the petition were dismissed from their jobs. In August 1844 Tyndall was hired by a railway surveying company in Lancashire at almost four times higher pay than the government had been paying him. D. Thompson (1957). "John Tyndall: A study in vocational enterprise". The Vocational Aspect of Education. 9 (18): 38–48. doi:10.1080/03057875780000061. Also Eve, A.S. & Creasey, C.H. (1945). Life and Work of John Tyndall. ^ Tyndall was the chief surveyor for the proposed railway line from Halifax to Keighley in 1846, according to Thomas Archer Hirst, who worked under Tyndall at the same engineering firm at the time – Ref. Tyndall described himself as the "principal assistant" at the firm – "Tyndall's Obituary for Hirst". Proceedings of the Royal Society of London. 52: xiv–xv. 1893. ^ Tyndall gave detailed recollections about his life in the 1840s in "Address Delivered at the Birkbeck Institution on October 22, 1884", which is published as a chapter in his New Fragments essays (1892). ^ Tyndall studied under Bunsen from 1848 to 1850. Thirty-five years later, he praised Bunsen for explaining chemistry and physics in "the language of experiment" and said "I still look back on Bunsen as the nearest approach to my ideal of a university teacher." New Fragments. ^ Tyndall's main 1850's research reports on diamagnetism were later republished as a collection, which is available at Archive.org. In the preface to the collection Tyndall writes about the work's historical context. William T. Jeans' biography of Tyndall (pp. 22–34) also goes into the historical context of Tyndall's diamagnetic investigations. ^ Michael Faraday advocated for Tyndall's appointment at the Royal Institution. As part of that, in a letter to the managers of the Royal Institution on 23 May 1853, Faraday praised Tyndall's abilities as a lecturer: "I have heard him on two or three occasions, when his manner of expounding nature by discourse and experiment was in my judgement excellent". Source: Emily Hankin (2008), "John Tyndall's Lecture Courses at the Royal Institution and their Reception". ^ Details of Tyndall's device for measuring the infrared absorptive power of a gas are described in James Rodger Fleming (2005). Historical Perspectives on Climate Change. Oxford University Press. pp. 69–70. ISBN 978-0-19-518973-5. Greater details are in Chapter I of Tyndall's own book Contributions to Molecular Physics in the Domain of Radiant Heat. ^ Tyndall explained the "greenhouse effect" in a public lecture in January 1863 entitled "On Radiation Through The Earth's Atmosphere". He emphasized that our environment would be much colder at nighttime in the absence of the greenhouse effect. This short, readable lecture is reprinted in his 1872 book about radiant heat, available here. ^ a b After his measurements of infrared absorption by gases in 1859, Tyndall measured infrared emission by gases in 1860, with respect to broad-spectrum infrared radiation. He did this for many different gases, and when the gases were ranked by their emissive powers the rank order was the same as it was for their absorptive powers. "On the Absorption and Radiation of Heat by Gases and Vapours, and on the Physical Connexion of Radiation, Absorption, and Conduction" by John Tyndall in Philosophical Transactions of the Royal Society of London, Volume 151, pages 1–36, year 1861. That article was later republished in the book Contributions to Molecular Physics in the Domain of Radiant Heat, Chapter I; and in the same book there is more in Chapter II section 11 (year 1862), and chapter IX section 6 (year 1865). 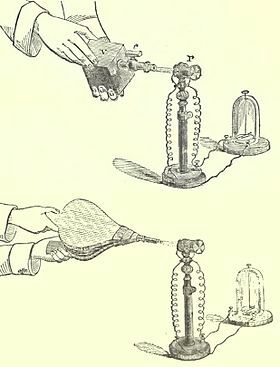 These laboratory experiments by Tyndall on "the reciprocity of absorption and radiation on the part of gases" were informed by experiments done on solids by Balfour Stewart in 1858 and 1859. The two relevant articles by Balfour Stewart are online as republished in 1901 in The Laws of Radiation and Absorption: Memoirs by Prévost, Stewart, Kirchhoff and Bunsen. ^ a b In the late 1850s Balfour Stewart had showed that cold rock-salt was a very strong absorber of the radiations from hot rock-salt, even though rock-salt was a very weak absorber of the radiations from all other kinds of heat-sources tested. By the early 1860s this had been generalized in the scientific literature to the principle that any kind of chemical will very strongly absorb the radiations coming from a separate body of the same kind of chemical. In Tyndall's words this was a "principle which lies at the basis of spectrum analysis, ... namely, that a body which is competent to emit any ray, whether of heat or light, is competent in the same degree to absorb that ray" (1866). Tyndall made several original observations around 1863 by beginning with the assumption that this principle is correct. The following is a summary of one of them. It was well-known at the time that in a flame of burning carbon monoxide, the carbon monoxide chemically combines with the oxygen of the air to form carbon dioxide plus heat. Tyndall observed that if a body of cold or room-temperature carbon dioxide is placed near the flame "the cold gas is intensely opaque to [i.e. it very strongly absorbs] the radiation from this particular flame, though it is highly transparent to [i.e. it very weakly absorbs] heat of every other kind." Thus the great bulk of the heat in the carbon monoxide flame fits the emission spectrum of carbon dioxide, implying the heat is a radiant emission from the newly formed carbon dioxide molecules. Tyndall got the same type of result with a flame of burning hydrogen, another flame known to be chemically simple in the sense that very little intermediate or transitory molecules are produced in it. This appears to be the first demonstration that the heat given out in chemical reactions has its physical origination within the new molecules. Tyndall's report of the demonstration is in Contributions to Molecular Physics in the Domain of Radiant Heat, sections 11–17 of Chapter VI, dated 1864. A related demonstration is in sections 3–8 of Chapter V, dated 1863. It is also discussed in Tyndall's Fragments of Science, Volume I Chapter III, dated 1866. For a modern analysis of where the heat is coming from in the carbon monoxide flame see R. N. Dixon (1963). "The Carbon Monoxide Flame Bands". Proceedings of the Royal Society of London. Series A. 275 (1362): 431–446. Bibcode:1963RSPSA.275..431D. doi:10.1098/rspa.1963.0178. JSTOR 2414583. Tyndall also interpreted the carbon monoxide flame as showing that carbon dioxide's spectral profile remains the same at room temperature and at a temperature of over 2000 °C, the temperature in the flame; and likewise for the product of the hydrogen flame. This was in contrast to the easily seen fact in solids such as carbon and platinum where the spectral profile moves towards the quicker frequencies when the temperature is increased. ^ Reported in a 10-page biography of John Tyndall by Arthur Whitmore Smith, a professor of physics, writing in an American scientific monthly in 1920; available online. ^ The term Tyndall Scattering is subject to some definitional overlap with the terms Rayleigh Scattering and Mie Scattering. ^ A brief account of the early history of thermophoresis studies is given in Encyclopedia of Surface and Colloid Science, 2nd edition, year 2006, pages 6274–6275. Thermophoresis was first described by Tyndall in a Royal Institution lecture titled "On Haze and Dust", year 1870, which is included in Tyndall's 1870 book Scientific Addresses. He observed the thermophoresis in gas mixtures. Unrelatedly and unknown to him, thermophoresis was observed in liquid mixtures in 1856 by Carl Ludwig. ^ Contributions to Molecular Physics in the Domain of Radiant Heat pages 199–214, dated 1863. Those experiments demanded "scrupulous accuracy, and minute attention to details", he later said (ref). In one of his other and simpler experiments, infrared plus visible light beaming from an 1860s-vintage electric lamp was brought to a focus point via a powerful concave mirror. On its way to the focus point, the beam was passed through a body of liquid water. At the focus point, beyond the water, the beam was able to set wood on fire but was not able to melt frozen water. On removal of the intervening body of liquid water, the frozen water rapidly melted. This indicates that frequencies emerging from water are specifically frequencies that water molecules do not absorb and water's phase state does not have a discernible role. Contributions to Molecular Physics page 314 (year 1865); and ref page 84-85 (year 1866). ^ James W. Gentry; Lin Jui-Chen (1996). "The Legacy of John Tyndall in Aerosol Science". Journal of Aerosol Science. 27: S503–S504. Bibcode:1996JAerS..27S.503G. doi:10.1016/0021-8502(96)00324-2. 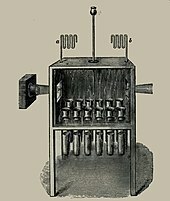 Tyndall's primary contributions were...[among other things]... the design of experiments which increased the deflections of the galvanometer by two orders of magnitude from the earlier measurements for double refraction (by Knoblauch) and the Faraday effect (by de la Provostaye and Desains). Tyndall's presentation of the subject begins under the heading "The Identity of Light and Radiant Heat" in his 1873 tutorial book Six Lectures on Light. ^ Michael B. Jaffe (2008). "Infrared Measurement of Carbon Dioxide in the Human Breath: Breathe-Through Devices from Tyndall to the Present Day" (PDF). Anesthesia & Analgesia. 107 (3): 890–904. doi:10.1213/and.0b013e31817ee3b3. See also John Tyndall, Contributions to Molecular Physics in the Domain of Radiant Heat, §4 of Chapter II (dated 1862) and §13 of Chapter VI (dated 1864). ^ Tyndall's experiment on ozone is in sections 17–19 of "Further Researches on the Absorption and Radiation of Heat by Gaseous Matter", dated January 1862; online. Some biographical sketches of Tyndall state that Tyndall "showed that ozone was an oxygen cluster rather than a hydrogen compound" (this statement is at Today in Science History and The Encyclopedia of Earth, for example). But it is an overstatement, because other researchers had already shown at an earlier date that ozone was an oxygen cluster. Tyndall's experiment just helped to reaffirm it by a different method. For background historical context see "The History of Ozone 1839 – 1868", by Mordecai B. Rubin (2001). ^ Discussed in Tyndall's book The Floating-matter of the Air. Tyndall writes (page 46): "Gravity is not the only agent.... It is practically impossible to surround a closed vessel by an absolutely uniform temperature; and where differences of temperature, however small, exist, air-currents will be established. By such gentle currents the floating particles are gradually brought into contact with all the surrounding surfaces. To these they adhere, and the suspended matter finally disappears from the air altogether." ^ Microform.co.uk has a catalog (perhaps incomplete) of letters from Pasteur to Tyndall. Communications between the two were most frequent during the mid-1870s. The earliest letter from Pasteur to Tyndall is dated 10 August 1871. Pasteur's early research had been in fermentation vats and broths. As he aimed to extend his program to air, he got in touch with Tyndall as someone who was an expert at dealing technically with air. In June 1871 extracts from a lecture by Tyndall entitled "Dust and Disease" were published in the British Medical Journal. The "Dust and Disease" lecture was Tyndall's first publication in this area. Ten years later Tyndall published a 350-page book Essays on the Floating-matter of the Air in relation to Putrefaction and Infection which consists primarily of descriptions of his own experiments. ^ Conant, James Bryant (1957). "Pasteur's and Tyndall's Study of Spontaneous Generation". Harvard Case Histories in Experimental Science. 2. Cambridge, Massachusetts: Harvard University Press. pp. 489–539. ^ Ian Taggart History of air-purifying type gas-masks in the 19th-century Archived 2 May 2013 at the Wayback Machine. John Tyndall (1871), Fireman's Respirator, and John Tyndall (1874). "On Some Recent Experiments with a Fireman's Respirator". Proceedings of the Royal Society of London. 22 (148–155): 359–361. doi:10.1098/rspl.1873.0060. JSTOR 112853. ^ Lord Rayleigh, who published a much-praised tome about sound in 1877–78, has a review of Tyndall's original contributions to the science of sound in Proceedings of the Royal Institution, Volume XIV, pages 221–223, dated 16 March 1894. Tyndall's own presentation of his "Researches on the Acoustic Transparency of the Atmosphere" is in chapter VII of the 3rd edition (1875) of Tyndall's book Sound. ^ In the later 19th century the Royal Society of London compiled an international catalog of scientific research papers, covering the whole century, indexed by author. In the Royal Society's catalog 147 entries appear under Tyndall's name between 1850 and 1883. Between 1850 and 1863 Tyndall published 74 papers in research journals, an average of nearly one every two months. A listing of these papers can be found in the Royal Society's 1872 publication Catalogue of Scientific Papers Volume VI. From 1864 through 1873 he published 41 papers, and these are listed in the Royal Society's Catalogue of Scientific Papers Volume VIII. From 1874 through 1883 he published 32 papers, and these are listed in Catalogue of Scientific Papers Volume XI. He produced very little after he got sick in 1885. Apart from his research papers, between 1860 and 1881 Tyndall also published 13 science books (see List of John Tyndall's books). ^ "John Tyndall's Lecture Courses at the Royal Institution and their Reception" by Emily Hankin (year 2008), pages 28–31, says that Tyndall and his audiences liked experimental demonstrations that had an element of spectacle, and that Tyndall selected lecture topics with that consideration partly in mind. The biographers Eve and Creasey are quoted as saying: "His lectures were written down, rehearsed, and profusely illustrated with experiment. He knew that a public lecture should have the same exacting care in production as a play in a theatre." ^ Daniel Colladon's 1842 "light fountain" article is entitled "On the reflections of a ray of light inside a parabolic liquid stream". The history of this during the 19th century is in the book The Story of Fiber Optics by Jeff Hecht, year 1999, Chapter 2. In Tyndall's own 1870 book Notes on Light Tyndall has a section entitled "Total Reflexion" where he explains: "When the light passes from air into water, the refracted ray is bent towards the perpendicular.... When the ray passes from water to air it is bent from the perpendicular.... If the angle which the ray in water encloses with the perpendicular to the surface be greater than 48 degrees, the ray will not quit the water at all: it will be totally reflected at the surface.... The angle which marks the limit where total reflexion begins is called the limiting angle of the medium. For water this angle is 48° 27', for flint glass it is 38° 41', while for diamond it is 23° 42'." ^ Quoted from Tyndall's Fragments of Science, Volume II. ^ In early 1861 Tyndall was writing: "All the gases and vapours hitherto mentioned [which are absorbers of radiant heat] are transparent to light; that is to say, the waves of the visible spectrum pass among them without sensible absorption. Hence it is plain that their absorptive power depends on the periodicity of the undulations which strike them.... By Kirchhoff it has been conclusively shown that every atom absorbs in a special degree those waves which are synchronous with its own periods of vibration." Contributions to Molecular Physics in the Domain of Radiant Heat. ^ Contributions to Molecular Physics in the Domain of Radiant Heat, pages 80–81 (dated 1862). He says on page 334 (dated 1869) that the difference in absorption rates "may be a millionfold" : [abridged] "Let nitrogen and hydrogen be mixed mechanically together in the proportion of 14:3. Radiant heat will pass through the mixture as through a vacuum; the amount of heat intercepted is so small as to be practically insensible. The moment the nitrogen and hydrogen build themselves together into the molecules of ammonia [NH3] the amount of radiant heat which they absorb is augmented more than a thousandfold. It may be a millionfold, for we do not yet know how small the absorption of the absolutely pure mixture really is. The act of chemical union is the sole cause of the enormous alteration in the amount of heat intercepted. The converse is also true: dissolve the chemical bond of the ammonia, and you instantly destroy the absorption." ^ In 1853 Anders Ångström had argued, based on general principles of resonance, that an incandescent gas should emit luminous rays of the same frequencies as those it can absorb. After this was affirmed and made more general experimentally by Tyndall and others in the early 1860s, Ångström got a lot of plaudits. When the original paper by Ångström (published in German in 1854) was published in English in 1855, the translator from the German was John Tyndall. John Charles Drury Brand (1995). Lines of light: the sources of dispersive spectroscopy, 1800–1930. CRC Press. pp. 61–. ISBN 978-2-88449-162-4. ^ Contributions to Molecular Physics in the Domain of Radiant Heat page 428, dated 1868. When talking about chemical reactions produced by light he says "if the absorption [of radiant energy] were the act of the molecule as a whole, the relative motions of its constituent atoms would remain unchanged, and there would be no mechanical cause for their separation [in a photochemical decomposition]." Therefore in a photochemical decomposition, "it is probably the synchronism of the vibrations of one portion of the molecule with the incident waves which enables the amplitude of those vibrations to augment [i.e. resonate] until the chain which binds the parts of the molecule together is snapped asunder." ^ Maria Yamalidou (1999). "John Tyndall, The Rhetorician of Molecularity. Part One. Crossing the Boundary towards the Invisible". Notes and Records of the Royal Society of London. 53 (2): 231–242. doi:10.1098/rsnr.1999.0077. Maria Yamalidou (1999). "John Tyndall, The Rhetorician of Molecularity. Part Two. Questions Put to Nature". Notes and Records of the Royal Society of London. 53 (3): 319–331. doi:10.1098/rsnr.1999.0085. See also Tyndall's popular essay "Atoms, Molecules, and Ether Waves" (year 1882) in Tyndall's book of essays for a broad audience, New Fragments. ^ According to the account in Tyndall's book The Glaciers of the Alps (1860), Tyndall in 1858 reached the summit of Monte Rosa solo carrying only a ham sandwich for sustenance. The first ascent of Monte Rosa had taken place only in 1855. He had already reached the summit of Monte Rosa in a guided group on 10 August 1858 but he made an unplanned second ascent solo on 17 August 1858 after breakfast: "the waiter then provided me with a ham sandwich, and, with my scrip thus frugally furnished, I thought the heights of Monte Rosa might be won...." (continued at pages 151–157 of Glaciers of the Alps). Besides Tyndall's own books, information about Tyndall as a mountaineer is available at A History of Mountaineering in the Alps by Claire Eliane Engel and The Victorian Mountaineers by Ronald Clark. ^ That quotation from Tyndall appears in the 1911 Encyclopædia Britannica article about Tyndall. For Forbes' view of the issue see "Appendix A" (plus Chapter XV) of Life and Letters of James David Forbes. ^ Brewer, William H. (1873). "Discovery of Mount Tyndall". The Popular Science Monthly. 2: 739–741. ^ Haast, Julius (1864). "Notes on the Mountains and Glaciers of the Canterbury Province, New Zealand". Journal of the Royal Geographical Society of London. 34: 87–96. JSTOR 1798467. ^ Among the hundreds of public lectures by Tyndall for non-specialist audiences at the Royal Institution, he delivered in 1861, 1863, 1865, 1867, 1869, 1871, 1873, 1875, 1877, 1879, 1882 and 1884 the annual Royal Institution Christmas Lectures for young audiences on the subjects Light; Electricity at Rest and Electricity in Motion; Sound; Heat and Cold; Light; Ice, Water, Vapour and Air; The Motion and Sensation of Sound; Experimental Electricity; Heat, Visible and Invisible; Water and Air; Light and the Eye and The Sources of Electricity, respectively. Appendix A at REF lists subject areas of other lecture series for non-experts by Tyndall at the Royal Institution over the years. ^ During the 14 days in December 1872 when Tyndall gave public evening lectures in Manhattan, The New York Times printed news items about Tyndall on 9 of the days, some of them lengthy efforts at recapitulating what Professor Tyndall had said in his lecture the night before about the nature of light. The New York Times noted that more than half the people attending the lectures were women (which was generally true of Tyndall's lectures in London as well) and noted that the series of evening lectures about the nature of light delivered in Washington DC was attended by eminent U.S. Senators, Cabinet Ministers, and one night the U.S. President himself, accompanied by his daughter. The New York Times Archives, 4 December 1872 – 9 February 1873. ^ Tyndall was a celebrity in the later 19th century and he was one of the people profiled in the 1878 book Celebrities at Home (2nd Series). ^ Tyndall said in 1884: "Two factors went to the formation of a teacher. In regard to knowledge he must, of course, be master of his work.... [and secondly] a power of character must underlie and enforce the work of the intellect. There were men who could so rouse and energise their pupils – so call forth their strength and the pleasure of its exercise – as to make the hardest work agreeable. Without this power it is questionable whether the teacher could ever really enjoy his vocation; with it, I do not know a higher, nobler, and more blessed calling." New Fragments. ^ Some of his science books were short, like 80 pages, and others were not. See the List of John Tyndall's books. ^ A catalog of the German editions of Tyndall's books at Worldcat.org. ^ A catalog of the French editions of Tyndall's books at Worldcat.org. ^ Quoted from Tyndall's The Forms of Water in Clouds and Rivers, Ice and Glaciers, year 1872. ^ John Tyndall, Sound, 3rd edition (1875). ^ The UK publisher was Longmans. The US publisher was Appleton. Longmans kept the book in print until sometime after 1908 and Appleton until sometime after 1915. See Worldcat.org. The German publisher, Braunschweig, introduced a renewed German edition in 1894; and the French publisher, Gauthier-Villars, in 1887. In Russian the first edition was in 1864 (ref) and an updated edition came out in Russian in 1888 (ref). ^ J. Clerk Maxwell (1871, 1872) Theory of Heat, preface page vi (publisher: Longmans, Green & Co). ^ A review of how Tyndall demarcated science from religion, marshalling quotes from Tyndall, is in Gieryn, Thomas F. (1999). "John Tyndall's Double Boundary-Work". Cultural Boundaries of Science. The University of Chicago Press. pp. 37–64. .
^ The text of Tyndall's 1874 Belfast Address is available at Victorianweb.org. This speech got more coverage in the Victorian-era newspapers than any other single public speech in the decades-long Victorian debate over the status of evolution theory. A lengthy review of the speech and the speech's reception by London newspapers was published by The New York Times on 5 September 1874. It is downloadable at ref. The great majority of London newspapers either endorsed Tyndall's position or took a neutral but respectful attitude towards it. Among other commentators the speech did have critics but a majority of these looked askance at subtleties and minor aspects (e.g.) Archived 7 September 2008 at the Wayback Machine, (e.g. ); only a minority defended a role for religious belief in formation of knowledge. As the London Times put it when the speech was making front-page news: "It is probably part of the great change in the manners of this country that [the speech]... will now encounter little contradiction even in the most religious circles" (reprinted by New York Times, 7 Sep 1874). Among the exceptions, the Irish Catholic bishops decried it as paganism. Because the speech got widespread attention and little contradiction, and came from the Establishment post of the presidency of the British Association for the Advancement of Science, later historians have seen the speech as the "final victory" of the evolutionists in Victorian Britain. E.g., Robert M. Young (1985). Darwin's Metaphor: Nature's Place in Victorian Culture. CUP Archive. p. 257. ^ Those quotations are from the Syllabus of Errors decree (year 1864, Pope Pius IX) and the Libertas decree (year 1888, Pope Leo XIII). The Libertas decree also says: [¶27, abridged] "The divine teaching of the Church brings the sure guidance of shining light. Therefore, there is no reason why true science should feel aggrieved at having to bear the restraint of laws by which, in the judgment of the Church, human teaching has to be controlled." ^ For Italy see Prisoner in the Vatican. Also see Don O'Leary (2006). Roman Catholicism and modern science: a history. Continuum International Publishing Group. pp. 57–. ISBN 978-0-8264-1868-5. .
^ For a list of Tyndall's pamphlets against Irish Home Rule search both Amazon and National Library of Australia. One of the pamphlets, Mr. Gladstone's Sudden Reversal of Polarity, documented how British Prime Minister Gladstone did a flip-flop on the Home Rule question. The intent was to undermine Gladstone's intellectual credibility on the question. Gladstone publicly defended himself against the attack. The debate between them got a lot of attention in the newspapers. Tyndall was a conspicuous participant in the Irish Home Rule debate in the London newspapers between 1886 and 1893. When he died in 1893, The Times newspaper obituary noted that "our readers will remember many eloquent letters written by him of late years, full of unsparing condemnation of Mr. Gladstone's recent [Ireland] policy." – Ref. ^ More from Tyndall's letter is in the year 1891 compilation Gladstone, Ireland, Rome: A word of warning to electors (publisher: Fowler Brothers), page 119. ^ The scientists of the British Isles were nearly unanimous in opposing Irish Home Rule, but, to Tyndall's disappointment, a majority of them also thought that the matter didn't have enough direct bearing on the vital interests of science to warrant an organized formal denunciation by them. See: Jones, Greta (2001). "Scientists against Home Rule". In Boyce, D. George; O'Day, Alan. Defenders of the Union: A Survey of British and Irish Unionism Since 1801. London: Routledge. pp. 188–208. .
^ a b c The collection of Tyndall's essays where his views on religion are most clearly stated is Fragments of Science, Volume Two (also published under the title Fragments of Science for Unscientific People). It is online in HTML text format at Gutenberg.org and in other text formats at Archive.org. ^ a b DeYoung, Ursula (2011). A Vision of Modern Science: John Tyndall and the Role of the Scientist in Victorian Culture. p. 280. ISBN 0-230-11053-3. Reports that Tyndall's religious beliefs were "half-agnostic, half-deistic" (page 2) and "Tyndall viewed religion itself as both inescapable and emotionally necessary for humanity, though his conviction of religion's importance was often lost on his critics" (page 5). ^ William Hodson Brock; Norman D. McMillan; R. Charles Mollan; Royal Dublin Society (1981). William Hodson Brock, ed. John Tyndall, essays on a natural philosopher. Royal Dublin Society. p. 67. He did not give an answer – but he remained a confirmed agnostic. ^ Arthur Whitmore Smith (1920). John Tyndall (1820–1893). The Science Press. p. 338. Tyndall, like most of his friends, was a reverent agnostic. He did not believe that the ultimate truths of the universe could be expressed in words, or that our limited and finite intelligence could as yet comprehend them. His writings, however, contain many phrases which show that he was familiar with the books of Holy Scripture. And often, after a Sunday evening tea, he would join his friends in the singing of psalm tunes. ^ John Brooke; Geoffrey Cantor (2000). Reconstructing Nature: The Engagement Of Science And Religion. Continuum International Publishing Group. pp. 250 + 254. ISBN 9780567087256. Tyndall's biographers rightly insist that he was not an atheist and instead suggest that he should be labelled an agnostic since he rejected the claims of both scientists and theologians who allowed science to be debased by ungrounded speculations. ^ John H. Lienhard (2006). How Invention Begins: Echoes of Old Voices in the Rise of New Machines. Oxford University Press. p. 204. ISBN 9780195305999. The agnostic physicist John Tyndall once remarked that Faraday drank from a fount on Sunday that "M" " refreshed his soul for a week. ^ Simon Thompson (2011). Unjustifiable Risk? : The Story of British Climbing. Cicerone Press Limited. p. 38. ISBN 9781849653787. Tyndall was a committed agnostic who argued fiercely and frequently and once offered to fight a man who disagreed with his high opinion of Thomas Carlyle. ^ Ronald L. Numbers; John Stenhouse, eds. (2001). Disseminating Darwinism: The Role of Place, Race, Religion, and Gender. Cambridge University Press. p. 77. ISBN 9780521011051. Free thinkers and agnostics indeed occupied chairs at Canterbury College and the University of Otago. A. W. Bickerton, professor of chemistry at Canterbury, had trained in London under militant agnostics T. H. Huxley and John Tyndall, and tirelessly popularized scientific materialism in Christchurch, to the annoyance of local Christians besides Maskell. ^ Professor Tyndall's Deed of Trust in Popular Science Monthly, May 1873. See also Prof. Tyndall's Trust in The New York Times, 8 July 1885. ^ Gladstone's Home Rule. The New York Times, 25 June 1892. ^ The value of Tyndall's estate at probate was £22122: biography of John Tyndall by W. M. Brock in Oxford Dictionary of National Biography (2004). Some ways to assess today the magnitude of £22,122 wealth in 1893 are at MeasuringWorth.com. ^ Haia Shpayer-Makov. "A Work-Life History of Policemen in Victorian and Edwardian England" (PDF). University of Haifa, Israel. p. 10. ^ In late years he was taking magnesia for dyspepsia and chloral hydrate for insomnia. His wife, who administered the drugs, accidentally gave him none of the former and a lethal overdose of the latter. A newspaper report of Mrs. Tyndall's testimony at the coroner's inquest: "Mrs. Tyndall's Fatal Error". The New York Times (1893). 25 December 1893. ^ Edward Frankland (1894). "Obituary Notice of John Tyndall". Proceedings of the Royal Society of London. 55: xviii–xxxiv. ^ Dry, Sandra (2018). "A long-awaited biography does justice to John Tyndall, a pioneering climate researcher and science advocate". Science. 360: 1307. ^ Louisa Tyndall wanted a collaborator, but was unsatisfied with all candidates. Later, according to Crowther, she would only accept one who would live in her own house, and none such was found. Crowther, J. G. (1968). Scientific Types. London: Barrie & Rockliff, The Crescent Press Ltd. pp. 187–188. ^ "Tyndalldenkmal". map.geo.admin.ch. Swiss Confederation. Retrieved 10 April 2019. ^ The short book On Radiation (1865) was wholly incorporated into the long book Fragments of Science (1871). ^ The short book Scientific Addresses was published in America only. It consisted of three speeches delivered in Britain in 1868–1870. Partly published in Britain in the short book entitled Essays on the Use and Limit of the Imagination in Science. Some of this material was republished in the Fragments of Science collection. Eve, A.S.; Creasey, C.H. (1945). Life and Work of John Tyndall. London: Macmillan. 430 pages. This is the "official" biography. William Tulloch Jeans wrote a 100-page biography of Professor Tyndall in 1887 (the year Tyndall retired from the Royal Institution). Downloadable. Louisa Charlotte Tyndall, his wife, wrote an 8-page biography of John Tyndall that was published in 1899 in Dictionary of National Biography (volume 57). It is readable online (and a 1903 republication of the same biography is also readable online). Edward Frankland, a longtime friend, wrote a 16-page biography of John Tyndall as an obituary in 1894 in a scientific journal. It is readable online. D. Thompson (1957). "John Tyndall (1820–1893): A study in vocational enterprise". Journal of Vocational Education & Training. 9 (18): 38–48. doi:10.1080/03057875780000061. Gives an account of Tyndall's vocational development prior to 1853. Brock, W.H. (1981). John Tyndall, Essays on a Natural Philosopher. Dublin: Royal Dublin Society. 220 pages. Arthur Whitmore Smith, a professor of physics, wrote a 10-page biography of John Tyndall in 1920 in a scientific monthly. Readable online. Anon (1894). "Obituary notices". Journal of the Chemical Society, Transactions. 65: 389–393. doi:10.1039/CT8946500382. John Walter Gregory, a naturalist, wrote a 9-page obituary of John Tyndall in 1894 in a natural science journal. Readable online. An early, 8-page profile of John Tyndall appeared in 1864 in Portraits of Men of Eminence in Literature, Science and Art, Volume II, pages 25–32. A brief profile of Tyndall based on information supplied by Tyndall himself appeared in 1874 in "Scientific worthies, IV.--John Tyndall". Nature. 10 (251): 299–302. Bibcode:1874Natur..10..299.. doi:10.1038/010299a0. .
Claud Schuster, John Tyndall as a Mountaineer, 56-page essay included in Schuster's book Postscript to Adventure, year 1950 (New Alpine Library: Eyre & Spottiswoode, London). DeYoung, Ursula (2011). A Vision of Modern Science: John Tyndall and the Role of the Scientist in Victorian Culture. Palgrave Macmillan. p. 280. ISBN 0-230-11053-3. .
Jackson, Roland (2018). The Ascent of John Tyndall. Oxford University Press. p. 556. ISBN 9780198788959. The first major biography of Tyndall since 1945. Allan, Jennifer Lucy. "Horn Section: John Tyndall's 1873 Foghorn Testing Sessions". In Strang, Veronica; Edensor, Tim; Puckering, Joanna. From the Lighthouse: Interdisciplinary Reflections on Light. Routledge. ISBN 9781472477354. 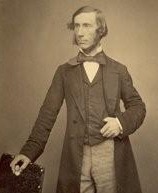 Wikimedia Commons has media related to John Tyndall. A blog maintained by a historian who is involved in transcribing Tyndall's letters.